I am slowly adding more crochet dish towels to my kitchen inventory! 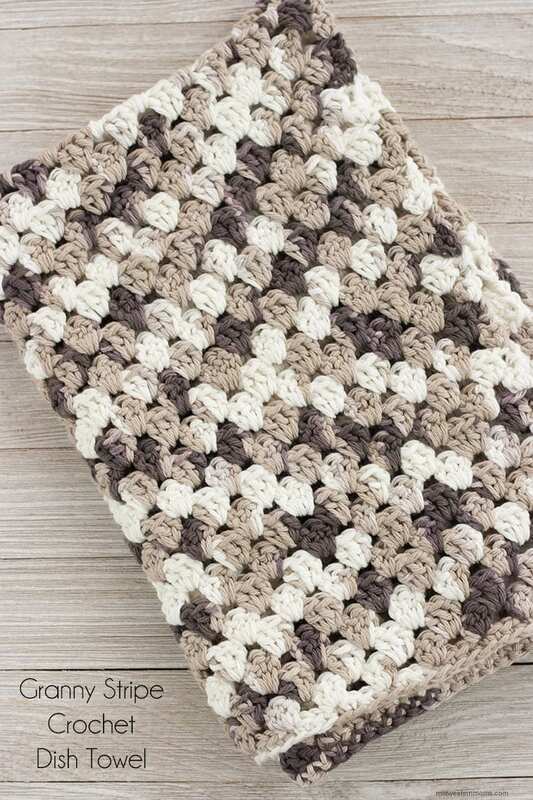 This Granny Stripe Crochet Dish Towel is made to be paired with the granny stripe dishcloth! When working on dish towels, I advise getting a cone of cotton yarn. This way you do not need to worry about having enough balls of yarn to complete the project. Plus when you use a cone, you will have extra to make matching dishcloths!! 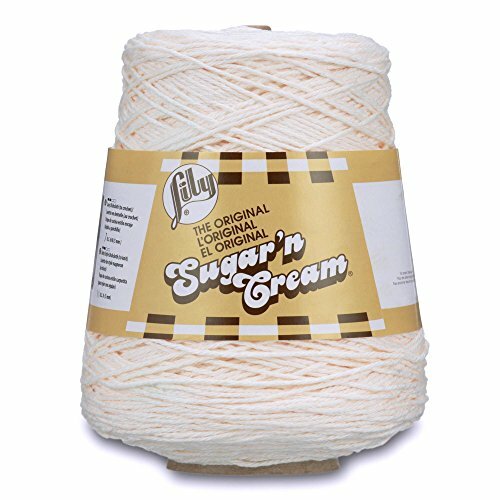 Also, I never use acrylic yarn. It simply does not soak up water like cotton yarn. Acrylic can be scratchy as well so it may scratch delicate dishware and glassware. 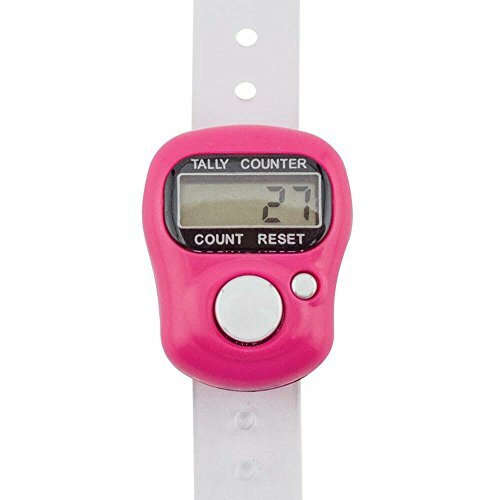 Another tool that I find very handy is my Susan Bates Digital Row Counter. I use it on all my bigger projects. With little ones running around, I never lose count of my rows when I use it. Important: If you modify this pattern, the starting chain will need to be a multiple of 3 + 1. This dish towel measures 16 inches wide x 25 inches long when finished. Row 1: Chain 51 + 1. Chain 1. Single Crochet in the second chain from the hook. Single crochet 1 stitch into each chain, all the way to the end. Turn your work. Row 2: Chain 3, double crochet once in the same stitch (this will create a double crochet cluster). *Skip 2 stitches, crochet 3 double crochets in the next stitch (this creates a double crochet cluster). * Repeat from the * to * until 3 stitches remain. Skip 2 stitches, crochet 2 double crochet stitch into the next/last stitch (this creates a double crochet cluster). Turn your work. Row 3: Chain 3, crochet 3 double crochets (which creates a double crochet cluster) into the first space between double crochet clusters. *Crochet 3 double crochets (which creates a double crochet cluster) in the next space between double crochet clusters. * Repeat from the * to * all the way to the end. Crochet 1 double crochet in the top of “Chain 3” from the previous row. Turn your work. Row 4: Chain 3, Crochet 1 double crochet in the same stitch (which creates a double crochet cluster). *Crochet 3 double crochets (which makes a double crochet cluster) in the next space between double crochet clusters. * Repeat from the * to * all the way to the end. Crochet 2 double crochet stitches (which creates a double crochet cluster) in the top of “Chain 3” from the previous row. Turn your work. Row 5-54: Repeat Rows 3 and 4 until you get to row 54. Row 55: Chain 1 and single crochet across. Want to be able to print this pattern? Simply put your email address in the newsletter box below. An email will be sent to you with the link to print the pattern.